Smart thermostats are the latest in HVAC system controls that assure maximum management over not only your indoor temperature and humidity levels, but for control over how much you are spending to effectively cool and heat your indoor spaces. At Allison Air Conditioning, we are the Corona, CA and Inland Empire area’s top purveyors of smart thermostat systems and can handle the installation, programming, calibration and service of the top brands and models of smart thermostats on the market today. With the ability to save your home or business an average of 20% on monthly and annual heating and cooling energy costs, the innovative Côr™ thermostat from the industry’s leader in HVAC manufacturing is an all-in-one control center for managing both your home comfort levels as well as managing and fine-tuning your energy expenditures. This smart thermostat helps you to maximize energy savings through its programmable settings, local weather forecasts, vacation settings, and cost reports. 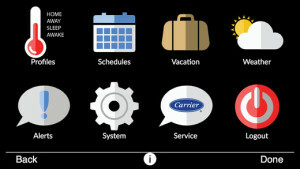 The Côr™ smart thermostat comes with a long list of helpful features for homeowners and business owners including a full color touch screen that is easy to use and easy to program, detailed energy reports that allow you to customize your settings for either maximum comfort or maximum energy savings, and is plug-in ready for use with hybrid heating systems and humidity control systems. 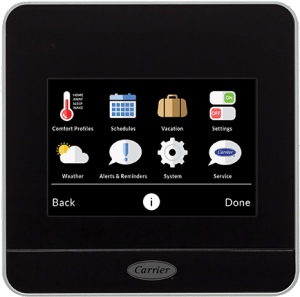 If you are considering replacing your older heating or air conditioning system, or are thinking of upgrading to a brand new energy-saving HVAC system, then now is the best time to consider installing a smart thermostat to accompany your new HVAC system. We can assist you with the installation of your heating or cooling system and install a brand new smart thermostat for maximum control of your indoor air comfort, indoor air quality, and heating and cooling energy expenses. Have Questions About How Smart Thermostats Work? Ready to Install Your Smart Thermostat System Now?